Take 2 tbsp of oil,when hot add ladyfingers and fry until they are brown in colour.Remove and keep aside. Now take the remaining oil in a pan/cooker,add onion and green chillies. Fry till pink in colour.Add mutton pcs and salt.Saute for 3-4 mintues. Then add ginger garlic paste,turmeric powder,coriander powder and red chilly powder. Add tomatoes and mix throughly.Let it cook for 4-5 minutes. 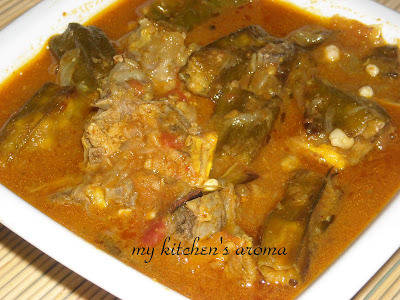 Open cooker when the pressure is gone,add fried lady finger to the mutton gravy. 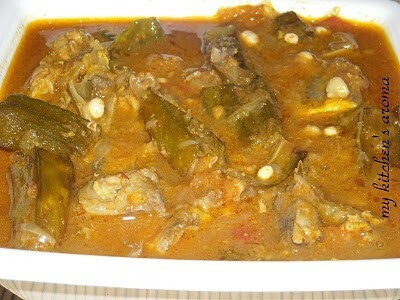 Cook for 2-3 minutes till the gravy is thick.Remove from fire and serve hot with hot rice/parathas/rotis. 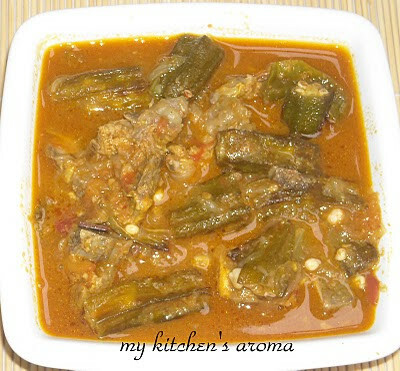 Never combined mutton & okra, sounds delicious and tempting dish..makes me hungry..
Mutton and okra together - pure love!